Mike and Madi Hussey carry firewood into their home in along Route 1A in Ellsworth on Saturday. They use a gas powered generator for electricity and a wood stove to keep warm. Hessey said the generator is the same one he bought for the 1998 ice storm. Mike Hussey put out a sign letting Bangor Hydro know he has no power at the entrance to his home in Ellsworth along Route 1A. Hussey had been without power since Monday at noon. 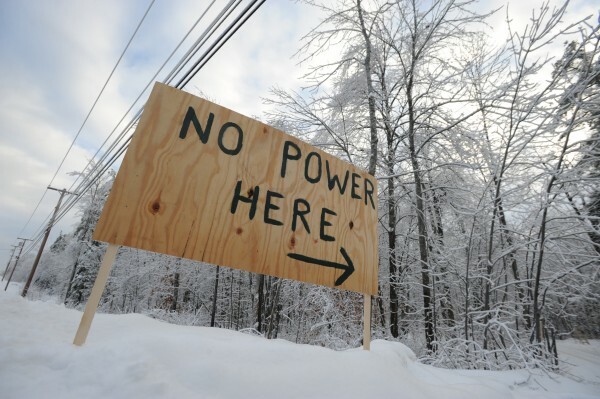 BANGOR, Maine — While the number of Bangor Hydro-Electric Co. customers without power had dropped to just under 3,000 by Sunday morning, most of those in Hancock County, the utility warned that the snow coming Sunday afternoon and early Monday could cause the number to rise. Customers who do not have power should seek alternative shelter, said Faloon, who encouraged those who lose their power again or see new safety problems to call Bangor Hydro. “Customers should be sure to call about fallen power lines or trees near or touching them rather than attempt to remove the lines and trees themselves,” she said. Power outages for some are expected to last through New Year’s Day, the Bangor Hydro spokeswoman said. “All customers are expected to have power restored by the end of the day Wednesday,” Faloon said. Central Maine Power reported fewer than 100 outages as of 8:30 a.m. Sunday, but by noon the number had increased to 1,493, with Waldo and Kennebec counties tallying the biggest numbers. CMP had more than 87,000 customers without power on Christmas Eve morning and brought in all of its employees, as well as 370 line crews and 450 tree crews on contract from utilities and private companies from Maine, Canada, and throughout the Northeast to work on fixing the problems. “Over the course of the storm, 123,000 customers lost power at least once,” the CMP website states. A winter storm warning has been issued for much of the state that goes into effect at 3 p.m. Sunday and stays in effect until 7 a.m. Monday, according to the National Weather Service in Caribou. For the Bangor area, snow and freezing rain are expected to start falling after 5 p.m. with between 6 and 10 inches on the ground when people awake Monday morning. Bar Harbor should see rain, freezing rain or sleet start falling at about 3 p.m. Sunday, and communities in Aroostook County shouldn’t see snow, expected to only tally between 2 to 4 inches, until later in the evening. Snow in The County will continue to fall until Monday morning and forecasters are warning about freezing temperatures and wind chill factors.